In this video, Dr. Okanoya’s hypothesis is that Evolution of song complexity in finches might mirror evolution of language in humans. The origin of the human capacity for Language is a central question and any small step towards an answer would be a towering achievement. Unfortunately, Dr. Okanoya’s work does not accomplish that. 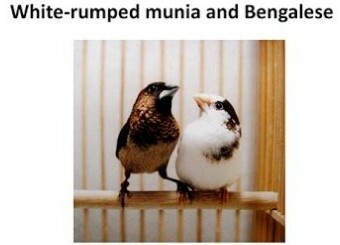 As neither a sub-species of White-rumped Munia nor a strain of Bengalese is specified, the experiment can’t be reproduced. Since the White-rumped Munia used didn’t receive appropriate care, the observations very likely only reflect that flawed husbandry. Also, there’s no recording of the White-rumped Munia song in the natural state. it’s quite possible that the birds belonged to a number of different Lonchura striata sub-species from outside Hong Kong. THE AVICULTURAL MAGAZINE — THIRD SERIES. VOL XII., 1921. More recently, European bird breeders produced a hybrid strain of Bengalese finches. The details of this program are not known. writes of eight sub-species of Lonchura striata. Were all the different domestic varieties tested for song complexity? Were they found to be identical? The speculation that birdsong is somehow similar to human language is intertwined with the surmise that self-domestication was a feature of human evolution. Is one hypothesis being used to prove another? We are shown a picture of a Bengalese and are told that “It looks like very white and very domesticated.” How exactly do the Bengalese look domesticated? Yes, white mice are domesticated, but there are many other colors of domestic mice. The bird shown is a heavy pied and indeed there are all-white Bengalese, but these are not the most common. Many Bengalese are lightly pied (mostly dark) or even completely dark. An attempt is being made to fit the Bengalese into the Domestication Syndrome chart. The pied color variety is a match, and probably increased reproductive capacity, too. Most of the other features listed either are not applicable (“floppy ears”) or are not found in the Bengalese. The discussions of domestic animals in the CARTA talks are about retained infantile traits in comparison with human evolution. White plumage is not an infantile trait in White-rumped Munias. Of course the little White-rumped Munia displays no inter- or intra-specific aggression anything at all like wolves or great apes. A strange experiment is performed where the wild bird variety and the Bengalese are subjected to electric shocks. That the White-rumped Munia is measured as biting harder is given as evidence of increased aggression. All that’s actually shown is that the White-rumped Munia has stronger beak muscles than the Bengalese. The one with the higher level of aggression is the person tormenting the poor birds. To record songs of White-rumped Munias, we set mist nets and captured males . . . Birds were marked with colored leg rings. Because the birds were stressed when they were captured,they did not sing right away; therefore, we kept them for a few weeks to months to ensure they were habituated to the captive condition. Exact coordinates are given for the collection sites, so it might be possible to verify the subspecies / race used. Prayer Bird release is also practiced in Taiwan. As these might be other subspecies of Lonchura striata, just knowing the location may not be enough for identification. Each bird should have been banded with a coded / numbered band. That way, there would be no questions about the identity of any particular bird or its original location. It also would have been good if photos were taken of each bird, both the wild Lonchura striata and the domesticated Bengalese used in the study. Was any attempt made to observe the Lonchura striata in nature to determine the song complexity there? If yes, were recordings made? Did the song of these birds in nature show the same lower level of complexity as heard in the laboratory? It’s not reasonable to expect wild-caught birds ever really to habituate to a cage or even a small flight. Every living thing tries to remain so and then to reproduce. That captive animals don’t die and manage to produce offspring demonstrates only that husbandry is at least minimal, not optimal. There’s no reason to expect the behavior of wild animals in captivity to be the same as in the natural state. is very roomy for a small group of the domesticated Bengalese, but is inadequate for wild-caught White-rumped Munias. To expect to observe behavior that’s a fair approximation of what one might see in nature, each pair of wild-caught White-rumped Munias should be kept in a planted flight of perhaps 1.25m X 2.25m X 2.25m. It also would be good to find out how far these birds nest from each other in the natural state. If they don’t nest within sight of each other, then flights, at the very least, can’t be adjoining. Unless an attempt is made to provide something like an environment suitable for non-domesticated birds, what’s very likely to happen is that a corrupted (neurotic?) variant of behavior will be delivered. Another factor is the constant stress that a strange and unnatural environment engenders. These responses, although temporary defense mechanisms against specific stimuli, place a bird in a state of general nonspecific stress, in which growth rates and resistance to many diseases are diminished. What’s very likely is instead for the wild-caught White-rumped Munias to have increased CORT levels because of the stress of a strange environment — captivity. This won’t change after a few generations of nests in a cage. The White-rumped Munias will continue to find life behind bars stressful for generations, indeed until a domesticated strain is developed. Another source of stress is if the wild-caught White-rumped Munias either are afflicted by disease / infested with parasites when collected or if the birds become infected from the Bengalese. Was any attempt made to document the health of the White-rumped Munias at the time of capture? This should include inspection for external parasites (mites and lice), internal parasites (worms) and the full range of microbial pathogens? And what about the Bengalese? There’s every reason to expect any and all persistent infections of the Bengalese immediately to afflict and adversely affect the stressed White-rumped Munias. The best course would be to maintain the White-rumped Munias separated from any domestic birds. Avian malaria has been shown to be detrimental to canary song. Other diseases might have the same effect. discusses bats tracking frogs at night. This has no relevance to the behavior of any bird during the day. is concerned with the raiding of nests at a location that’s revealed by the hen’s call. This paper has no relevance to the singing of a courting male White-rumped munia. to use sight (unlike when seeking rodents where sound and air currents come into play) and target those feeding on the ground. Snakes generally focus on odor to detect prey. Song birds can perform hidden in foliage. And for those that do their singing on a highly visible stage, it will be high up and far away from cats and with an eye towards the sky for hawks. Birds preyed on by hawks (and falcons) are very aware of the presence of danger. Just walking down my block in Jersey City, from time to time I’ll notice the absence of pigeons, starlings or sparrows — all generally common. Almost always then if I look up, I’ll see a bird of prey — perhaps just as a very small figure way up overhead. Singing long, complex songs also have physiological cost. but in the paragraphs that follow, there are a number of additional speculations, not proofs. When a female is paired with a guy with nice song, that female decides to allocate more reproductive resource to that mating. Society finches possess an exceedingly strong breeding desire. Even though Bengalese are fine models for learned vocalization, this species poses complications for comparing a domestic species to a wild ancestor. The connection between the various sub-species of the White-rumped Munia and any particular strain of Bengalese might very well elude definition and require interpretation instead. 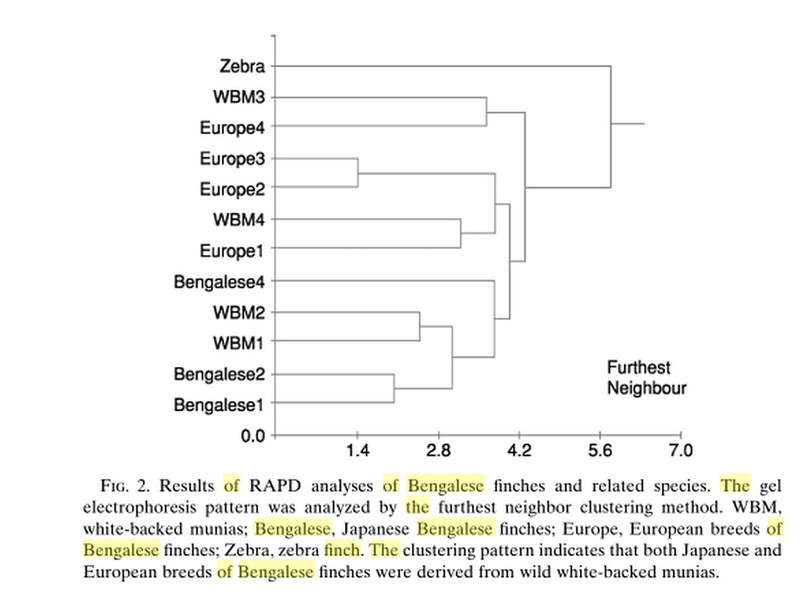 To allow for the results of an experiment investigating a difference between wild Lonchura striata and the domestic Bengalese to be repeated, the population of the White-rumped Munia and the strain of Bengalese must be specified. Better species to use might be the Australian Zebra Finch (Taeniopygia guttata), hybrids of which are not common and generally are easily recognized, and the Budgerigar (Melopsittacus undulatus), with hybrids either unknown or exceedingly rare. Both of these species are very common in the wild and definitely are the source of the domestic birds. One drawback is that Australia does not allow exports, so research on the wild populations would need to be done there. Song The natural song of the Begalese is similar to that of the White-rumped Munia, although a comparison between the sonograms of the songs of a Chinese Begalese and a Chinese White-rumped Munia in my possession show the wild bird’s song to be more complex. In general both song and display are similar to that of the L. striata but there is much individual variation, particularly in the song. One male I studied had a clear descending warble or trill quite unlike the song of any L. striata.